Elements Resuscitation cart REN-04ST: cabinet steel coated with powder varnish consistent with RAL palette, top made of ABS plastic, with a deepening, surrounded by three bands, base made of steel with ABS plastic cover, fitted with buffers and 125 mm casters, two with blocking mechanism Equipment and add.. Elements Resuscitation cart REN-03ST made of: cabinet steel coated with powder varnish consistent with RAL palette, top made of ABS plastic, with a deepening, surrounded by three bands, base made of steel with ABS plastic cover, fitted with buffers and 125 mm casters, two with blocking mechanism Equipment.. Elements Resuscitation cart REN-06ST made of: cabinet steel coated with powder varnish consistent with RAL palette, top made of ABS plastic, with a deepening, surrounded by three bands, base made of steel with ABS plastic cover, fitted with buffers and 125 mm casters, two with blocking mechanism Equipment.. Elements Resuscitation cart REN-02ST made of: cabinet steel coated with powder varnish consistent with RAL palette, top made of ABS plastic, with a deepening, surrounded by three bands, base made of steel with ABS plastic cover, fitted with buffers and 125 mm casters, two with blocking mechanism Equipment.. Elements Resuscitation cart REN-01ST made of: cabinet steel coated with powder varnish consistent with RAL palette, top made of ABS plastic, with a deepening, surrounded by three bands, base made of steel with ABS plastic cover, fitted with buffers and 125 mm casters, two with blocking mechanism Equipment.. Elements Resuscitation cart REN-05ST made of: cabinet steel coated with powder varnish consistent with RAL palette, top made of ABS plastic, with a deepening, surrounded by three bands, base made of steel with ABS plastic cover, fitted with buffers and 125 mm casters, two with blocking mechanism Equipment.. Elements Resuscitation cart REN/ABS made of: cabinet steel coated with powder varnish consistent with RAL palette, top made of ABS plastic, with a deepening, surrounded by three bands, base made of steel with ABS plastic cover, fitted with buffers and 125 mm casters, two with blocking mechanism Equipment .. 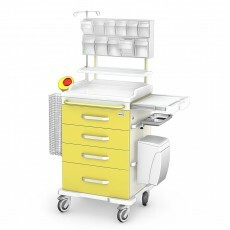 Elements of Treatment cart OPTIMUM series R Type (resuscitation trolleys) made of: cabinet, drawer steel coated with powder varnish frame made of aluminium profile, powder-varnished in white top made of ABS plastic, surrounded by three bands worktop made of ABS plastic or steel coated with powder varnish,.. 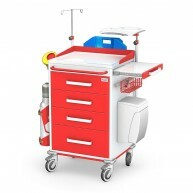 Elements Resuscitation cart REN/KO made of: cabinet entirely of stainless steel grade 0H18N9 top made of ABS plastic, with a deepening, surrounded by three bands, base made of steel with ABS plastic cover, fitted with buffers and 125 mm casters, two with blocking mechanism..